There’s a friendly (but rated) 6-game match going on between Aronian and Kramnik right now. There are no explicit anti-draw rules in place, but to help give the spectators (and sponsors) their money’s worth, if the game ends in a draw before 3 hours are up, then the two players have to play a rapid game. The results of any such rapid games aren’t used as tiebreakers. In the first game, Kramnik lost quite easily with the white pieces. In game two, a surprise Berlin (Aronian pretty much never plays 1.e4) petered out relatively quickly – there were some interesting variations, but they’ll be confined to the annotations and not the actual game. Not much seems to be going on here, but I’m not completely sure that Aronian would’ve accepted a draw here even if there were no anti-draw measures in place. This is because he at least can quickly generate some symbolic pressure against Black’s queenside: 20.Bc5 b6 21.Bf2 Rgd8 22.a4 Ne7 23.a5 c5 24.Nb5. 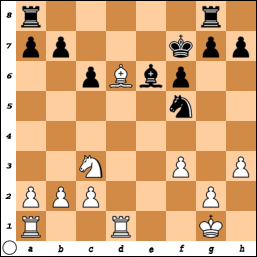 After 24…Nc6, though, Black seems to be holding without much trouble.